On Tuesday, June 16, the Coalition of Kaiser Permanente Unions held a Bargaining Council Endorsement Conference in Los Angeles with more than 400 union delegates in attendance. 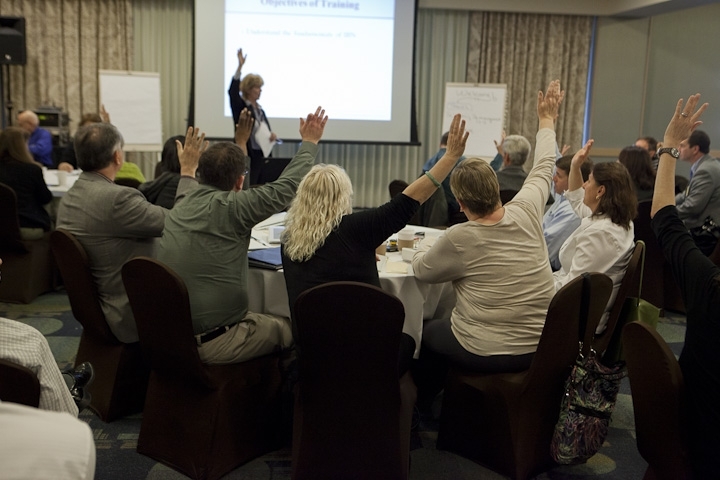 During this meeting, delegates reviewed and endorsed the 2015 Tentative Agreement. The tentative agreement now moves to the local unions for ratification voting, which will take place during the next two months. Click here for a list of Coalition Unions. The conference was the first step toward the local unions’ ratification of the new national agreement. If ratified, the agreement will go into effect on October 1, 2015. MANHATTAN BEACH, Calif., June 6, 2015—Kaiser Permanente and the Coalition of Kaiser Permanente Unions have reached a tentative agreement in the largest private-sector contract talks in the United States this year. The national contract will cover 105,000 unionized Kaiser Permanente health care workers in 28 local unions. The tentative agreement goes far beyond the traditional contract issues of wages and benefits. It develops standards to assist unionized workers, managers and physicians as they work together to achieve quality, affordability, and safety of care, prepare for jobs of the future, and develop innovative solutions to health care challenges. The agreement also will enable 3,500 frontline teams to better deliver award-winning care and service to Kaiser Permanente’s more than 10 million members and patients. • Wage increases in each year of the agreement, ranging from 2 to 4 percent depending on the region and the year of the agreement. • Enhancements to benefits such as dental coverage, life insurance and tuition reimbursement. • A long-term solution to preserve retiree medical benefits while reducing liabilities associated with those benefits. • Additional funding to two educational trust funds to ensure career development for Kaiser Permanente’s diverse workforce. • New goals for 3,500 front-line teams. Worker engagement and participation in these teams has helped Kaiser Permanente garner recognition for clinical quality, patient safety and member satisfaction from organizations such as U.S. News and World Report and the National Committee for Quality Assurance. • Updates to the groundbreaking Kaiser Permanente Total Health Incentive Plan, a voluntary program that encourages and empowers employees to make their own health a priority and builds a culture of workplace health. The program rewards employees for healthy behavior and provides incentives for collective improvement rather than singling out individual employees. • Joint participation by the coalition unions in community health projects and volunteer work. Once ratified this summer by local unions and national Kaiser Permanente leadership, the contract will cover 105,000 Kaiser Permanente unionized employees. They include 81,000 health care workers in California; 8,500 in Oregon and Washington; 5,000 in Colorado; 5,500 in Maryland, Washington, D.C. and Northern Virginia; 1,800 in Georgia; and 800 in Hawaii. The workers span hundreds of job classifications, from registered nurses and pharmacists, to maintenance and service workers. 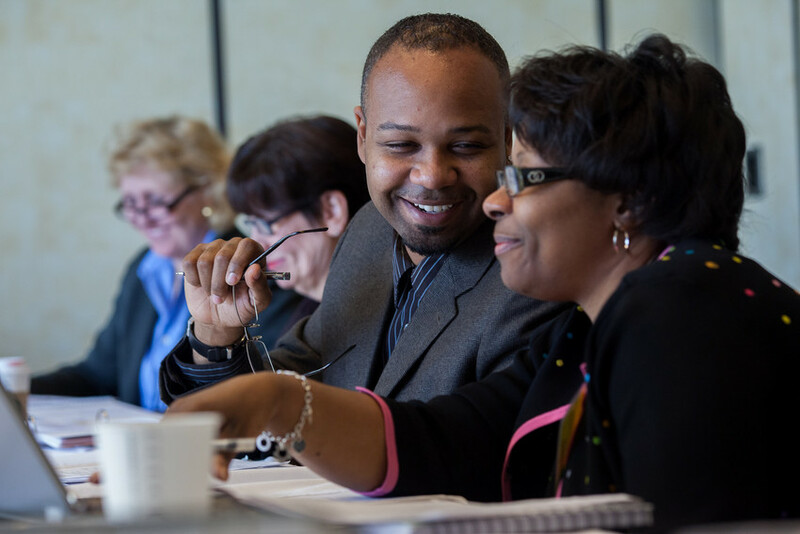 Kaiser Permanente and the Coalition of Kaiser Permanente Unions created the Labor Management Partnership (LMP) in 1997 to develop and support innovative ways of improving patient care, affordability and the work environment. Kaiser Permanente is recognized as one of America’s leading health care providers and not-for-profit health plans. It currently serves more than 10 million members. Nearly 200 people from Kaiser Permanente and the Coalition of Kaiser Permanente Unions continued 2015 National Bargaining this week in Los Angeles. Negotiators broke into subgroups to finalize their bargaining recommendations, which will determine the 2015 National Agreement and shape the future of the Labor Management Partnership. 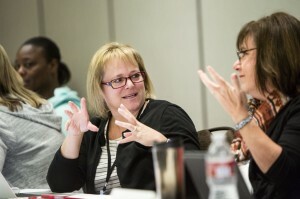 See this week’s bargaining action in a new slide show. Improving performance and strengthening partnership is the work of the Operational and Service Excellence in Partnership subgroup—one of three subgroups in national bargaining. The group made recommendations on topics including improving learning, accountability, problem-solving, consistency, flexibility and support for unit-based teams. For unit-based teams, subgroup members suggested ways to improve the spread of practices from one team to another and to ensure that UBT assessments accurately reflect performance. The subgroup also looked at ways to improve partnership at all levels of Kaiser Permanente, and at the elements—from tools to training—that affect its success. “Our group is trying to establish the principles of partnership and ensure they’re applied consistently across regions,” said Rita Essaian, an executive administrator with Southern California Permanente Medical Group. The next National Bargaining session will take place from June 3-5. Nearly two hundred people from Kaiser Permanente and the Coalition of Kaiser Permanente Unions continued 2015 National Bargaining this week in San Jose. Negotiators broke into subgroups to continue to hammer out shared management and union interests, which will determine the 2015 National Agreement and shape the future of the Labor Management Partnership. Delivering exceptional care and service, and supporting a healthier, injury-free workforce go hand in hand. 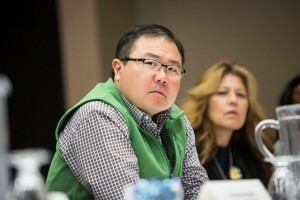 “We can’t provide quality, affordable care to our members and communities unless we first provide a safe and respectful environment that promotes the collective health of our workforce,” said Kathy Gerwig, Kaiser Permanente’s vice president of employee safety, health and wellness and the management co-lead for the Total Health and Workplace Safety subgroup. The subgroup’s goal is to find ways to help Kaiser Permanente employees enjoy long, healthy, productive lives. It will expand upon the achievements of the 2012 National Agreement, and also address how Kaiser Permanente and the Coalition of Kaiser Permanente Unions can partner to improve the Total Health of the communities we serve. In 2012, negotiators established the groundbreaking Total Health Incentive Plan. The wellness program encourages employees to assess their own health and aim for collective improvement in measures like cholesterol and body mass index. 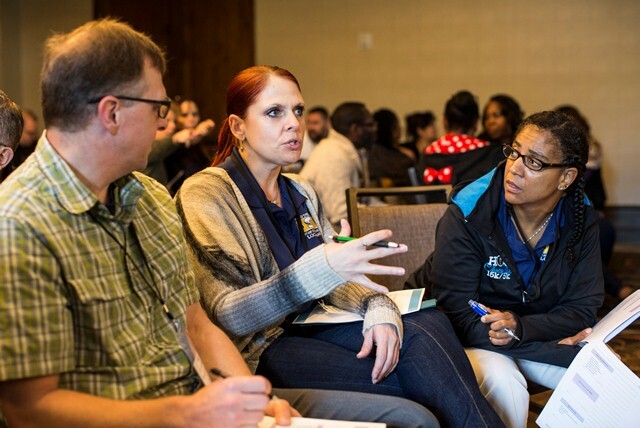 “By living healthy lives, Kaiser Permanente workers can serve as role models for our members and patients, and also contain the cost of our own care,” said Lisa Dupell, UFCW Local 555 and union co-lead for the Total Health and Workplace Safety subgroup. This year, the parties will suggest ways to improve employee access to services such as wellness coaching, encourage healthy eating and break-time exercise, and help employees understand and prevent workplace violence and intimidation. In a first for national bargaining, the subgroup will also suggest ways to bring a holistic approach to wellness into communities Kaiser Permanente serves, especially those with limited access to healthy food, affordable health services and places to exercise. The next National Bargaining session will take place from May 12– 14. This week, nearly two hundred people from Kaiser Permanente and the Coalition of Kaiser Permanente Unions met in Manhattan Beach, California. They broke into subgroups to discuss management and union interests for 2015 National Bargaining. The talks, which will determine the future direction of the Labor Management Partnership, went smoothly. “Health care is changing,” said Hal Ruddick, the executive director of the Coalition. “We have a huge new influx of members because of the Affordable Care Act. These new members have different needs and we can meet those needs through the solutions we create bargaining in partnership.” (See bargaining in action in this new slide show). 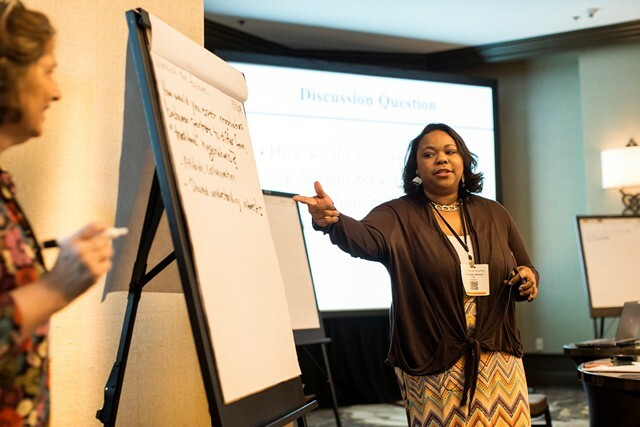 Equipping frontline workers with the skills and knowledge for tomorrow’s jobs—an essential element in preserving Kaiser Permanente’s competitive edge—is the focus of the Work of the Future subgroup. Participants heard the latest information on how health care, and health care jobs, are evolving. Zeth Ajemian, the director of Workforce Planning and Development for Southern California and Hawaii, said that flexibility, foresight and planning are essential to developing a workforce that is ready for coming changes in the health care industry. Leveraging technology to meet the emerging needs of our patients will be another key issue for the bargaining team, said Dennis Dabney, senior vice president of Labor Relations and the Labor Management Partnership. Whatever innovations are designed and implemented in the future, frontline workers need to be engaged from the start, say union partners. The next National Bargaining session will take place from April 28 – 30. 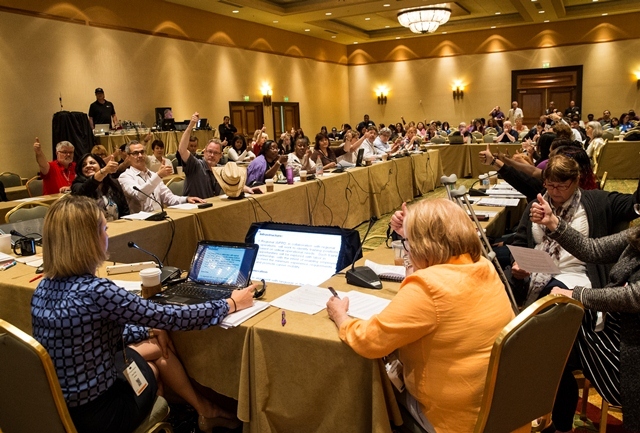 Hundreds of frontline workers, managers and top leaders from Kaiser Permanente and the Coalition of Kaiser Permanente Unions gathered in Costa Mesa, California, this week to kick off negotiations on a new national agreement. The talks will determine the future direction of the Labor Management Partnership. “This is the largest and most successful labor management partnership in the country, and it’s still going strong,” Jim Pruitt, vice president of LMP and Labor Relations for The Permanente Federation, told the crowd on the first day of the kick-off session. The kick-off session began with a day of presentations about the topics that will be the focus of this year’s negotiations—total health and workplace safety, the work of the future, and how to achieve operational and service excellence in partnership. Artie Southam, executive vice president of Health Plan Operations, described how consumers’ rising demands for transparency, value and personalized service are putting pressure on the health care industry to provide service at the level of the country’s top retail companies. “Our key work ahead is to consistently meet evolving and new consumer expectations everywhere throughout Kaiser Permanente,” he said. The second day of the kick-off session was dedicated to training the members of the Common Issues Committee—the team that will bargain the new national agreement—as well as the bargaining observers and alternates in how to engage in interest-based bargaining. This type of bargaining focuses both parties on resolving issues rather than staking out adversarial positions. Parties collaborate on finding a solution that meets the interests of both parties—with the goal of reaching consensus. Janelle Williams, a consultant specialist from the Office of Labor Management Partnership, is also participating in national bargaining for the first time, and she was impressed by negotiators’ enthusiasm and desire to achieve a national agreement that secures Kaiser Permanente’s future as a leader in health care. “Wages and benefits are important and essential to a good contract, but people are invested in the work they do and the value they deliver to members and that plays a huge role in this process,” she said. Visit bargaining2015.org for more information about national bargaining and to sign up to receive regular updates. Kaiser Permanente sits down at the table next week to talk with a coalition of national unions that represent its workers. It will begin negotiating one of the largest private-sector contracts up for renewal this year. The coalition represents 100,000 workers in 28 union locals in eight states and the District of Columbia. Workers include registered nurses, maintenance and service workers, technicians, lab scientists, optometrists and others. More than half live in Northern California; almost 5,800 are in the Sacramento region. Talks start Tuesday in Costa Mesa and are expected to finish in early June. If a deal is reached and ratified, it will take effect when the 2012 contract expires Sept. 30. That timing is a lot more compressed than the norm for traditional, single-union collective bargaining, where it’s not unusual for contract fights to go on for years. The approach is different, too. Issues are put on the table before wants. Kaiser’s national agreement goes far beyond wages and benefits, said Dennis Dabney, a senior vice president who heads up the health giant’s labor management partnership. Three main subgroups have been formed to address top issues, Dabney said. One will consider operational issues that include service, quality and patient satisfaction. Another will look at the workforce of the future, identify skills workers will need and training required to learn them. The third subgroup will address the health and safety of employees. Decisions made in the work groups are channeled to the folks sitting directly at the bargaining table. “We come to the table with an issue to discuss, both sides put data on the table, we look at mutual interests and craft a solution,” Dabney said. About 150 people will sit at a large U-shaped table where differences are bargained, but about some 300 front-line employees will be in the room, too. “How are you going to bargain with that many people?” Dabney wondered the first time he led the process — for the 2012 contract. “But it actually helps you because these are front-line employees who know how it really works,” he said this week. And front-line employees truly have a voice, said Hal Ruddick, executive director of the Coalition of Kaiser Permanente Unions. It doesn’t just happen, though. Outside facilitators work with both sides to identify issues, decide where talks will be held and come up with a schedule, Ruddick said. That’s a far cry from the way it works with some unions outside the partnership, including the staunchly independent California Nurses Association. In the last round, contract talks were supposed to start July 31 but didn’t because the two sides couldn’t agree on a location. They each picked the place they wanted and waited for the other to show up. It took three false starts and a federal mediator before there was agreement on ground rules and where to meet. Kathy Robertson covers health care, law and lobbying, labor, workplace issues and immigration for the Sacramento Business Journal. Kaiser Permanente and the Coalition of Kaiser Permanente Unions will begin national bargaining on March 30, 2015. These negotiations are likely to be the largest private-sector contract talks in the United States this year. Some 150 negotiators will assemble from all over the country to craft the new National Agreement, which serves as the union contract for more than 100,000 Kaiser Permanente workers represented by Coalition unions. The Agreement, a full expression of one of the most comprehensive and successful labor management partnerships in the country, guides the work that we do to bring quality and affordability to our members and patients—and a culture of health, high performance, and continuous learning to our workforce. This is the fifth full round of national-level bargaining since the Labor Management Partnership was created in 1997. Once negotiated and ratified, the new contract—covering workers represented by 28 union locals, as well as Kaiser Permanente managers and physicians—is scheduled to go into effect when the 2012 Agreement expires on Sept. 30, 2015. As in past years, negotiators will use the distinctive interest-based bargaining process that guided national bargaining in 2000, 2005, 2010, and 2012. Again, managers, workers, and physicians will sit together at the bargaining table as members of the Common Issues Committee, with many frontline union members observing the process. We appreciate your interest in this process, and are committed to keeping you informed. Visit www.bargaining2015.org for background on interest-based bargaining, details on the bargaining calendar, and updates on bargaining teams and topics. Kaiser Permanente managers will receive an email update after each bargaining session, and Coalition union members will receive regular updates from the publication InsideOut. Kaiser Permanente and the Union Coalition created the Labor Management Partnership in 1997 as a way to transform their relationship and the organization. It is the largest and longest lasting labor management partnership in the country, and is recognized for its unique approach and results, which are models for other healthcare organizations and unions. Webcast for KP Managers: What’s New in the National Agreement?